NOTE: This product has been replaced by Jet Shades™ Solutions for Pilatus PC12 Aircraft. Cool off your Pilatus PC-12 and enhance your ramp appeal. Jet Shades dress up your aircraft and enhance ramp appeal by giving your plane the “tinted windows” look. Pilot Cockpit Set. 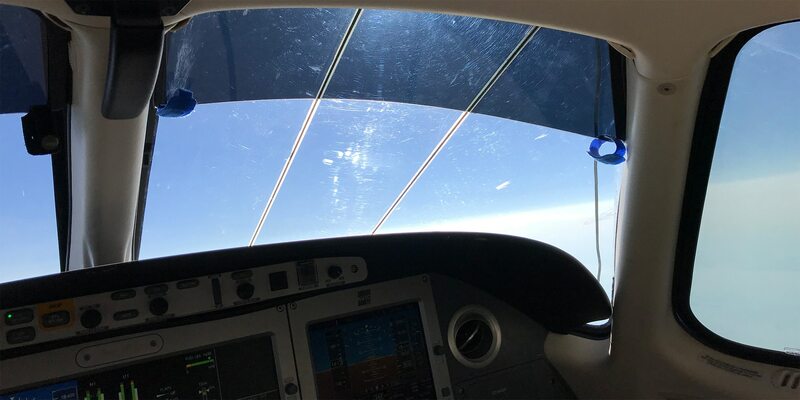 (5 Pieces) Covers the top portion of your Pilatus windshield and pilot side windows including pilot side vent window to prevent harmful sunlight heat, UV, and glare entering into the cockpit from above. Complete Package – Pilot Cockpit + Cabin Windows (14 Pieces). Includes pilot cockpit set, plus Jet Shades for passenger windows (9 pieces) insert into the passenger windows and provide protection from harmful sunlight heat, UV, and glare for your rear seat passengers. Passengers can enjoy the view without squinting or eye fatigue. Rides are cooler and comfortable for passengers allowing them to enjoy the scenery easily. Though I have not personally used this product I just want to say that for the cost, the carrying case should be included.